Inflammatory bowel disease (IBD) is a syndrome rather than a disease. The syndrome is caused by a specific reaction to chronic irritation of the stomach or intestines. Inflammation is the body's response to an insult, injury, or foreign substance. With inflammatory bowel disease, specific types of inflammatory cells, depending on the type of IBD, invade the wall of the stomach and/or intestines. 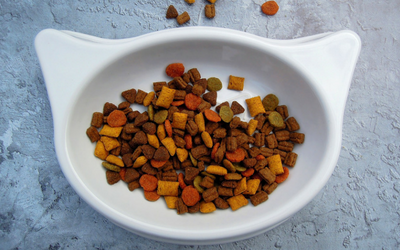 "Thickening of the gastrointestinal lining makes it harder for your cat to absorb nutrients." As inflammatory cells invade, the lining of the gastrointestinal(GI) tract thickens. This thickening makes it harder for your cat to absorb nutrients and to move food along the GI tract. IBD can involve any part of the gastrointestinal tract, but most commonly affects the stomach and/or the intestines. If the stomach is involved, your cat will experience chronic vomiting. 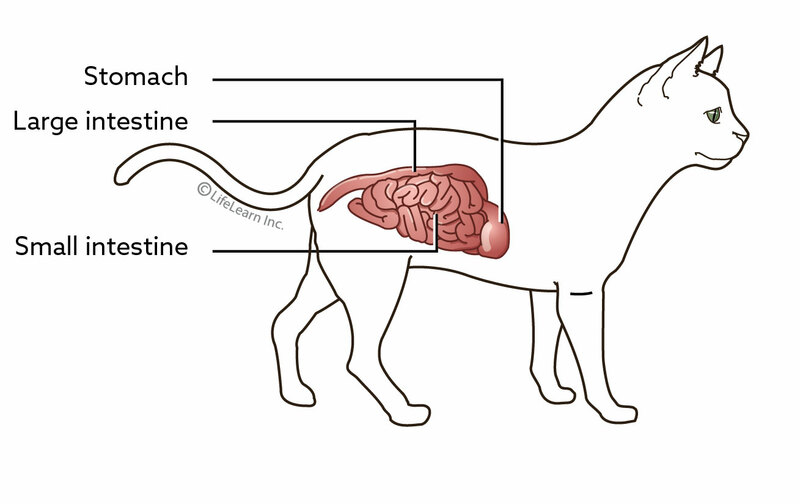 This is the most common clinical sign of IBD in cats. If the intestines are involved, chronic diarrhea will occur. In some cats, both parts of the digestive tract are involved so both vomiting and diarrhea occur. If the syndrome lasts for more than a few months, weight loss and poor appetite are common. In some cases, cats develop a ravenous appetite as they are unable to absorb the food they are eating. "IBD can involve any part of the gastrointestinal tract, but most commonly affects the stomach and/or the intestines." Vomiting hairballs more than once a month or so is not normal. Vomited hairballs represent the inability of your cat to pass the hair through their GI tract. If this is happening on a regular basis, your cat may have inflammatory bowel disease. Inflammatory bowel disease can be highly suspected through the use of ultrasound. 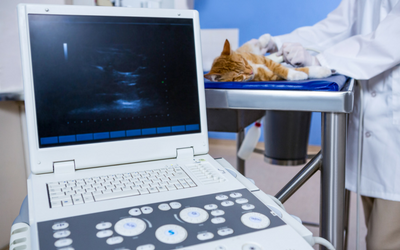 Ultrasound can measure the thickness of the stomach and intestinal linings, as well as evaluate the size of the lymph nodes around the intestines. The tissue biopsies will be sent to a veterinary pathologist for diagnosis. The pathologist will give a descriptive diagnosis to the syndrome, depending on the predominant type of inflammatory cells present in the biopsies. The chronic irritation that causes IBD stimulates the body to send cells from the immune system to the affected area. The most commonly found cells are lymphocytes and plasmacytes. Occasionally, eosinophils and neutrophils will be found. IBD is diagnosed when these cells are identified in abnormal levels in the tissue. The tissue reaction that occurs in the stomach, small intestine, or colon is diagnosed with biopsy as discussed above. The ideal way to treat this problem is to diagnose the underlying disease that is causing the reaction. If an exact cause cannot be found, the disease is called idiopathic (disease is present, but there is no identifiable cause). Many cases of IBD are considered idiopathic. Diet. Some cats with IBD will respond to a change in diet. This can be accomplished in one of two ways. First, a commercial food that contains a protein source that is new to the cat is chosen. If that is not effective, a high-fiber diet is tried. Unfortunately, a true food trial requires that the test diet be fed exclusively for six to twelve weeks. In some cases, your veterinarian will recommend that you feed a true elimination diet, in which a home-prepared diet containing only a single protein and a single carbohydrate are fed. In all food trials, no treats or other foods may be given at all. B12. Supplementation with B12 (cobalamin) can be considered as most cats with inflammatory bowel disease are unable to absorb this important vitamin. This is given by injection under the skin. Medications. If dietary therapy is not successful or is not possible to perform, and no underlying cause can be found, medications are used to suppress the inflammatory reaction. Corticosteroids are generally the most effective medications and are used initially. Other medications are tried if corticosteroids are not successful. Corticosteroids are notorious for causing a variety of side effects in humans. However, cats appear to be somewhat resistant to side effects from these medications. Regardless, to minimize any possible adverse effects, the goal is to use the lowest dose that is effective and to give it on an every other day schedule. It will be necessary to begin therapy with a high dose, but once a response to the medication occurs, the dose is gradually tapered to the minimal effective dose. Does this mean that I will be giving steroids to my cat for the rest of its life? If oral medications are difficult to administer, it may be possible to give periodic injections of a long-acting corticosteroid. The main disadvantage with long-acting injections is that once the medication is administered, it cannot be removed from the body if there are any problems. Prednisolone is the most effective anti-inflammatory drug with the least side effects. However, it is not effective in all cats. Sometimes a stronger drug such as chlorambucil is used initially to gain control of the disease. Then, prednisolone is tried again as a maintenance drug. Occasionally metronidazole (brand name Flagyl®), is used to help calm the inflamed gastrointestinal tract. Unfortunately, this medication has a bad taste and can cause decreased appetite or vomiting during treatment. Some spiral-shaped bacteria can cause chronic vomiting in cats. The most common of these bacteria is Helicobacter pylori. These bacteria have been shown to be the cause of disease, including stomach ulcers, in humans and are pathogens (organisms that cause disease) found in cats. However, they are also found in many normal cats and humans who do not experience any vomiting or stomach ulcers. Therefore, just finding spiral-shaped bacteria on biopsy is not always meaningful. It is considered a pathogen only if there is an associated inflammation in the stomach mucosa. Usually when found in humans, successful treatment may require several medications or combinations of medications. Currently what is effective for humans is being used to treat cats. This approach is successful in some cats, but the most effective means of treatment continues to be developed. Some cats are meticulous groomers and these cats usually swallow hair every day. Hairballs are a sign of either ingesting too much hair (overgrooming) or being unable to pass hairballs through the intestines. "Hairballs are a sign of either ingesting too much hair (overgrooming) or being unable to pass hairballs through the intestines." Frequent brushing and the use of hairball medications may be recommended for cats with IBD, especially if they have a history of vomiting or passing hairballs. If hairballs are occurring frequently, then an underlying cause should try to be identified. If a positive response occurs to a diet change, the cat can be maintained on the new diet for the rest of its life, provided the diet is appropriately balanced. If the cat responds to medication for stomach bacteria, the long-term prognosis is good. If response occurs to corticosteroids, the long-term prognosis is also good if administration of the drug is feasible. However, if there is no response to diet or corticosteroids, the prognosis is more guarded. In these cases, further testing is suggested to see if an underlying disease can be identified. Some forms of inflammatory bowel disease may progress to intestinal cancer. Chronic inflammation has been hypothesized as a cause of GI lymphoma in cats.